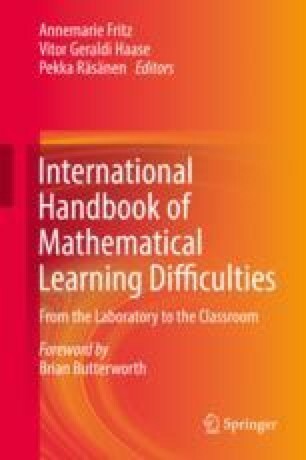 Whenever there is a choice between different treatment options for children with mathematical learning disability (MLD), it is important to understand the respective reasons. If mathematical difficulties are not a consequence of a core deficit in number magnitude representation but secondary to another problem (like ADHD or anxiety), this should be treated first. However, the results of a dyscalculia test alone are often insufficient to disentangle the possible reasons for a respective bad outcome. The present qualitative error analysis was carried out in a clinical sample of 51 secondary school pupils to gain more information about possible cognitive markers for respective differential diagnoses. The main results were that a group with primary MLD (or dyscalculia) did not differ from a group with secondary MLD in a variety of procedural errors (e.g. trading errors) and in multiplication table errors. On the other hand, several error types which can only be explained by faulty conceptual understanding of calculation procedures or the decimal system of numbers were made significantly more often by children with primary MLD. In conclusion, the more conceptual errors a pupil makes in basic arithmetic tasks, the higher is the need for an individual learning therapy.